We can hardly expect to find this showy clematis in bloom in December unless we happen to be living or travelling in the Southern Hemisphere, but nonetheless it seems right and proper to serve up its vibrant red for the holidays. It is about time that our series came round to it. For more than sixty years, 'Ernest Markham' has held its own in the trade, becoming in the long run one of the most accessible and widely appreciated of all the large-flowered hybrids. Did we say "red?" In many books and nursery lists, the colour of the flower is given as "magenta." In fact, if we take a casual sweep of the descriptions in books and nursery lists we find quite a range of suggestions. Is the flower (a) red, (b) rose-red, (c) petunia-red, (d) crimson, (e) red-violet, (f) red-purple, (g) cardinal red, (h) cerise, or (i) magenta? Well, possibly all of the above. Discounting the known fact that colour perceptions differ with the temperature, the intensity of the light, the optical equipment and vocabulary of the observer, and doubtless other considerationsand no one is keeping scorenone of these terms is patently wrong. But the diversity may be partly explained by a simple fact: the flower does undergo a rapid change of colour. As the brilliant red of its first day or two quiets down somewhat, purplish tints begin to appear, and before long magenta may seem to be the right word. Our second photograph, taken in bright sun, shows something else about the colours. The center of the blossom is most often said to be golden or yellow, but sometimes we see it described as light brown or chocolate brown or even sable. Some observers speak of stamens, others of anthers, and still others don't specify, so their reports are hard to coordinate. As it happens, nearly all the descriptions leave out a small feature that most of us who are not botanically trained might fail to take into account, but that can often be distinctive enough to help us identify a particular cultivar. The picture shows a brownish strip running down the center of each anther. This is what botanists call the "connective," which separates but connects the anther's two halves. Observers who describe the anthers of C. 'Ernest Markham' as dark are presumably looking at the connectives, which are fairly prominent when the flower is new. To get it exactly right, they would have to mention both. The anthers themselves are yellow (or golden if you will, or beige). Enough about the colour. The plant itself is a sturdy vine capable of 15 feet (5 m) in a season, though usually content with less. 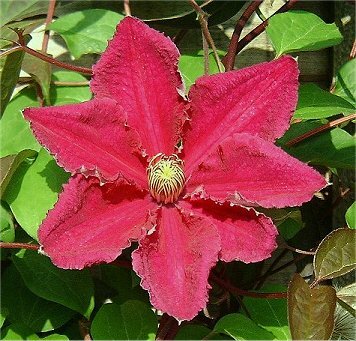 It has its main bloom in mid- to late summer and hence is ordinarily listed as a Group C (or III) clematis and pruned accordingly. But it also has enough of a Spring heritage to mount an earlier bloom on wood that has been left long. So there is a choice. The early bloom can be erratic, doing very little in some years and in others putting on a good displaymaybe even with a few of the flowers semidouble. A deep pruning is more likely to satisfy gardeners who prefer a reliable later bloom. Of course with a mature plant it should be possible to have it both ways, leaving a few stems long and deep-pruning all the rest. In speaking earlier of C. 'Huldine' we mentioned that when it was first exhibited in 1934, the introducer was the "real" Ernest Markham. He was able to include a picture of it in the brief but useful book on clematis he published the next year, with a long title (The Large- and Small-Flowered Clematis and their Cultivation in the Open Air), lists of what he considered the best plants, and an introduction by his longtime mentor and employer, William Robinson. Markham had risen over the years to be Head Gardener at Gravetye Manor, Robinson's vast estate in Sussex, and oversaw the breeding program that was one of its many activities. During much of that time he worked with a collection of seedlings they had taken over from the creative French hybridist Francisque Morel. 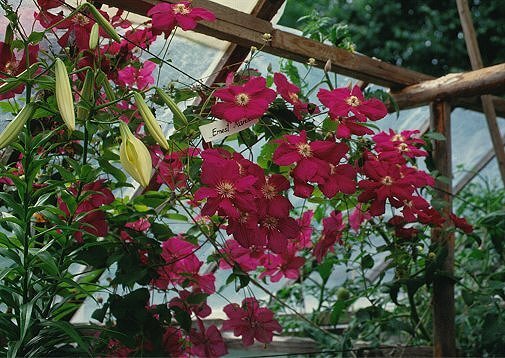 The clematis named for Markham at Jackman's after his death in 1937, known for a while simply as "Red Seedling," surely came either from that collection or from one of its matings at Gravetye.